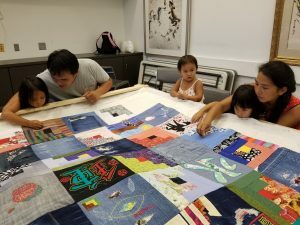 This textile arts/maker project incorporates participants' migration memories into a community story quilt. 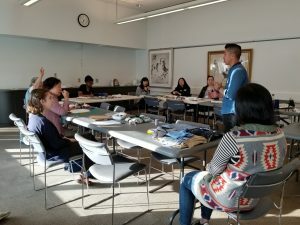 We held our workshops in a public library situated in downtown Flushing, a densely populated urban area of Queens, NY. A large percentage of local residents are first- or second-generation immigrants, especially from China and Taiwan. 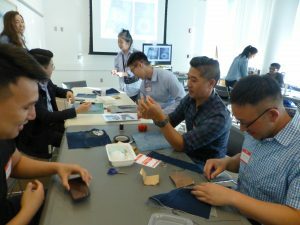 Participants included a variety of demographic groups: first- and second-generation Asian immigrants from the surrounding community; experienced quilters of diverse backgrounds from different parts of Queens; and students from nearby Queens College. 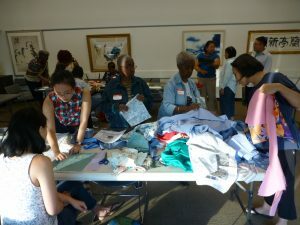 We had both men and women quilters, and ages spanned from young adults to senior citizens. 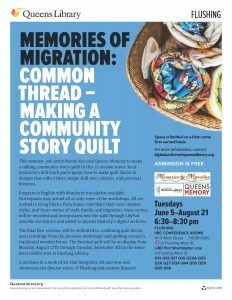 We advertised the workshops via flyers in the Flushing Library; through email lists administered by Queens Library, Queens Memory, Queens College and local arts organizations; and through the social media outlets of all the participants, including our four quilting instructors. 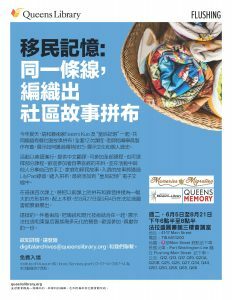 We had our flyer translated to reach out to the large number of Chinese-speaking patrons at the Flushing Library. 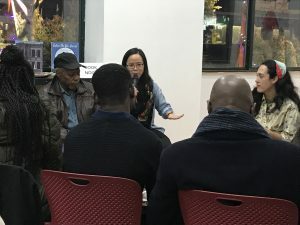 Interviews – participants as well as instructors were asked to share their or their families’ stories of migration (whether from another country to the U.S. or from another state to New York) and crafting traditions. These stories were recorded at the sessions and edited clips have been embedded in the quilt via LilyPad circuits. 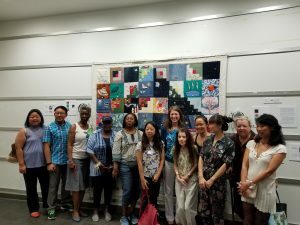 Public Art – the finished quilt, which measures 8 by 8 blocks, is being exhibited in several venues throughout the borough and will ultimately be permanently displayed at the Flushing Library. Making – attendees of the workshops learned to create quilt blocks using a variety of hand sewing techniques, as well as how to attach the blocks to backing material and turn them into a completed quilt. Participants in the last few sessions also learned how to incorporate the LilyPad circuit boards into the quilt using conductive thread. Textile – many types of materials and threads were used for the project, and quilters sampled numerous crafting techniques, including sanding and slicing denim; embroidering; measuring and cutting fabric to patterns; and quilting around a traditional wooden frame. We consider the workshop series to have been very successful. 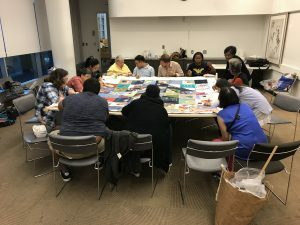 It resulted in the formation of a lively, diverse group of participants who contributed to the physical end product — a work of textile art imbued with the migration stories of its makers — in a variety of ways. 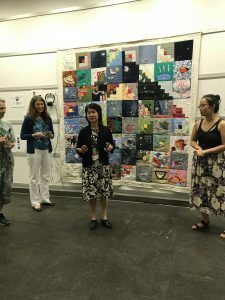 We were gratified by the dedication, enthusiasm and camaraderie that our quilters brought to the project, and we learned a tremendous amount from them along the way. The audio from each of the 21 quilt blocks that feature our migration stories are available on YouTube. As this was a complex project, we were unsure at the outset how large or complete our end product — the story quilt itself — would be. 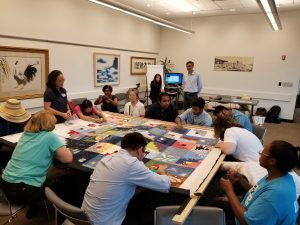 Due to the enthusiastic participation of the quilters and our instructors, the quilt turned out to be a sizeable work of art that was indeed complete and ready for exhibition by the end of the summer. We have since had several additional opportunities to display the quilt and share its stories (with more planned in the coming months), exceeding our initial expectations by far. 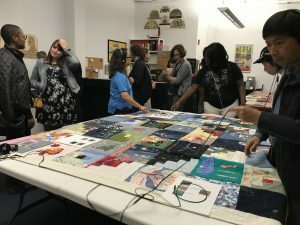 The project’s technology component — specifically, wiring the LilyPad circuit boards and sewing them to the quilt — proved to be the most challenging. The placement of the devices in relation to the buttons that activate the audio clips must be very precise, and we found ourselves running short of time in the last weeks. 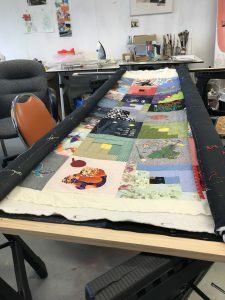 Completing this part of the project, which was critical to the quilt’s functioning as a “talking” work of art, required many extra hours in the studio from Naomi, Natalie and several of our most dedicated participants. In a future iteration of the project, we would build in more time to account for these tasks and perhaps also look for ways to make the delicate components and connections more sturdy. Meeting at the Queens College Tech Incubator with Ying, Natalie, Naomi, Lori and American Folk Art Museum representative. Natalie and Naomi visited the Mitchell-Linden branch to see if it would be a good place to host the project. Natalie picked up Naomi driving a library car, and on our way we imagined what it would be like for people to access this branch using public transportation since it was a little far from the 7 Main Street stop. We met with the branch manager, Farzaneh Momeni, who gave us a warm welcome and showed us the activity room. After having a conversation, we decided that since their program audience is mostly youth and seniors, this branch was not the ideal location though we would keep it in mind for future projects. We decided then to work with the Flushing branch, which had also offered us a slot for Tuesday evenings through the summer. After the site visit, Naomi stayed in the area to join the Community Board 7 monthly meeting. 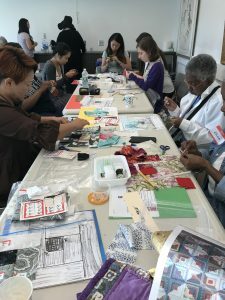 We had been in touch with Susie Tanenbaum, the Director of Immigrant & Intercultural Affairs with the Queens Borough President’s office, about local connections for sewing instructors. She had recommended we give a short presentation at the CB meeting. Naomi introduced the project and made a recruitment call during the public hearing time, and afterwards gave information to a World Journal reporter. 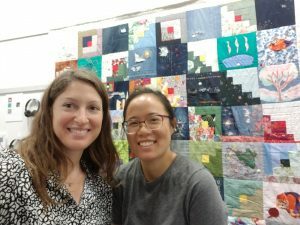 Naomi met with the Flushing Town Hall Executive Director, Ellen Kodadek, and Director of Education, Gabrielle Hamilton, to discuss the project and ask for connections to individuals in Flushing who might be a good fit to be sewing instructors. Ellen and Gabrielle generously listed names of both professional and personal connections, and through their outreach we got in touch with our fourth instructor, Helen Griffin. Meeting at Central Library with Natalie, Naomi and Lori to discuss logistics, publicity, funding, etc. Meeting at the Tech Incubator with Natalie, Naomi, Lori and American Folk Art Museum representative via phone. Naomi met with Stephen Au in the gym of P.S. 20 prior to a Good Friday church service. We discussed the project concept and started brainstorming about stories and techniques he could share during the workshops. We talked about how immigration affects not just the people who move but their whole families and the next generation also. Naomi met with Judy briefly during a monthly crafters gathering to confirm her involvement as an instructor and to clarify the project concept for further discussion at a later date. Naomi and Lori met with quilting instructor Thadine Wormly at Naomi’s studio at Queens College. They went over the project concept and brainstormed about stories and techniques Thadine could share during the workshops. Thadine and Naomi both shared examples of their textile work. 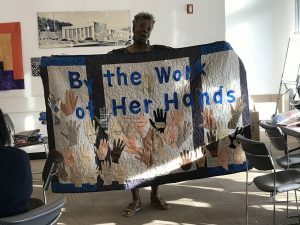 Prior to this meeting Naomi attended a Quilt-n-Queens guild meeting at the Jamaica Center for Arts and Learning, where Thadine is a longtime member and was leading the evening’s activities. After an initial phone call, Naomi met with Helen in the lobby of the Flushing Library and discussed the project concept and stories and techniques Helen could share. Helen brought some of her sewing to show Naomi and they had a nice but hushed conversation about quilting traditions and the history of Flushing. Helen agreed to lead the quilting portion of the project and was gracious about staying flexible to accommodate her instruction to whatever form the quilt top would take. Natalie, Lori and Naomi met with Gina Fazio, who showed us the third floor conference room where we would be doing our workshops. She gave us some more information about the library’s clientele, what we may expect from the people who come, and other logistics. Naomi had a follow-up meeting with Thadine at Naomi’s art studio at Queens College to confirm workshop plans. Thadine brought more pictures to show of the different collaborative quilting projects of which she has been a part. Naomi met Stephen and his wife Alice at their home in Forest Hills. We talked over coffee and a simple breakfast. Stephen had been hard at work coming up with ideas for the workshop activity and was excited to share them. We narrowed down a few options and talked about the things that we would need to prepare before June. Natalie, Lori and Naomi took a car to Materials for the Arts in Long Island City to shop for workshop materials. None of us had been there before, and we were pleasantly surprised at how much fabric and other things there were. We had to contain our curiosity to the hour time slot that we had and were successful in finding many of the things we needed. Afterwards, Natalie wrote thank you letters to the MFTA donors and also invited them to the workshops. Naomi met with Judy in the gym of P.S. 20 following a church service to discuss the content of her workshop. Judy shared some compelling memories of accompanying her mother to her work in garment factories and sweatshops. We discussed a general idea that she had for an activity and identified other community members she would work with to plan out the details. Our opening session! After introductions and an overview of the project given by Naomi and Natalie, our first instructor, Stephen Au, demonstrated techniques of “distressing” denim, based on his years in the fashi on industry. 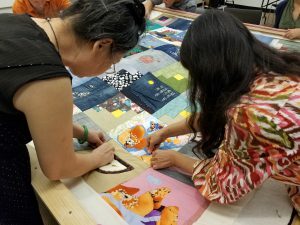 Our 12 participants enthusiastically began working on their denim quilt blocks while Stephen shared stories of his family and assisted the quilters individually. We set up audio recorders to capture Stephen’s presentation as well as any stories our participants chose to share for possible inclusion in the finished story quilt; we plan to do this for each working session. 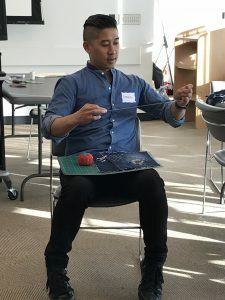 At our second session with instructor Stephen Au, most of the first week’s participants returned to continue working on their denim blocks. Stephen gave a condensed version of his introduction for the newcomers, and spent most of the session helping people with their design choices and sharing stories. 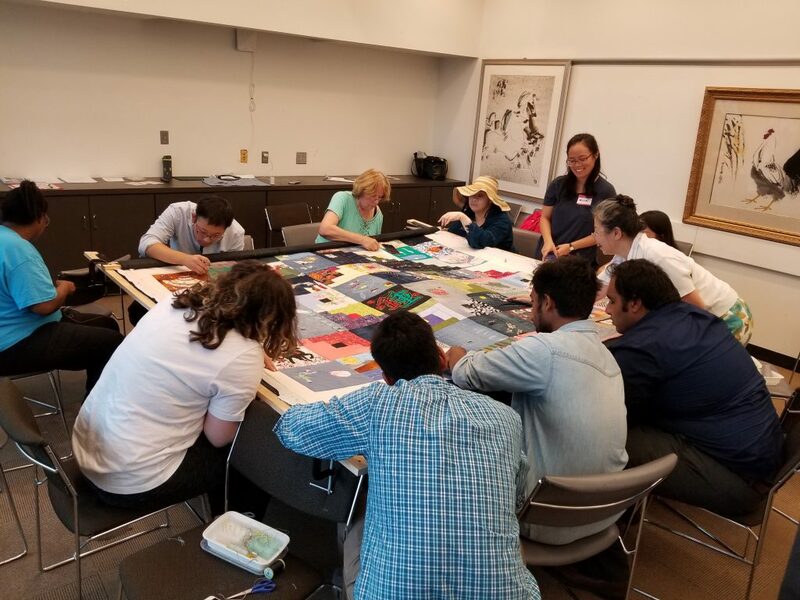 During the last half hour of the session, Naomi invited participants to show their work and share the meaning behind their designs, and four quilters did so. We were pleasantly surprised to see so many younger men participating in the workshop! Our first session with instructor Thadine Wormly, who taught the Log Cabin pattern. 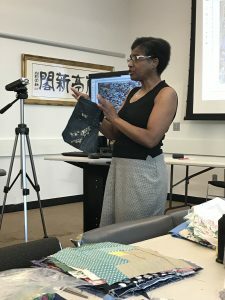 Thadine, an experienced quilter and leader of numerous quilting guilds and projects, gave a wonderful presentation on the history of Log Cabin quilts during the Underground Railroad period, when they were used as a secret language for enslaved African-Americans fleeing the South. 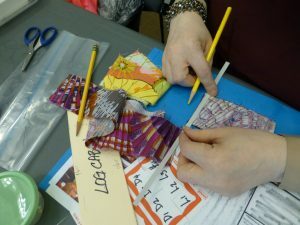 Thadine brought pattern kits and pre-cut center squares of fabric for quilters to work with, and our 11 attendees began creating their own versions of Log Cabin blocks. During our second session with Thadine Wormly, our 13 attendees continued working on the Log Cabin blocks. The more experienced quilters — many of whom had been part of Thadine’s other sewing groups — made multiple blocks once they got the hang of the pattern! 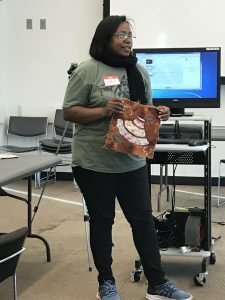 Thadine also treated the group to stories about special quilt initiatives in which she had participated, such as a cancer quilt project with Pomonok Library and Queens Hospital and By the Work of Her Hands, a collaboration between quilters in New York and Morocco. Session #5 was a “Show and Tell” evening. 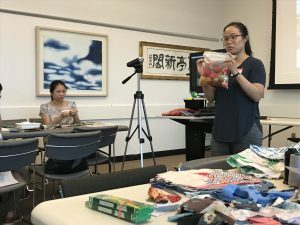 Participants were invited to bring in items relating to their own or their families’ craft traditions and/or display their quilt blocks in progress. We recorded the stories they shared for possible inclusion in the finished quilt. 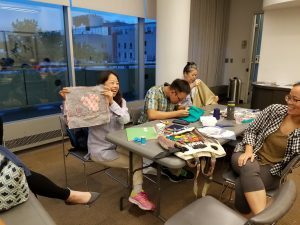 This was our first session with instructor Judy Chang, who taught the Panamanian mola style of reverse applique quilting. 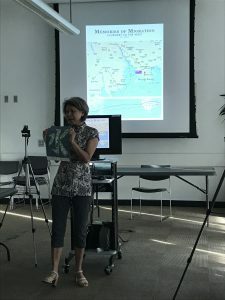 Judy shared the multigenerational story of her family’s migration from China to Panama and Panama to New York, and showed several examples of the mola technique. 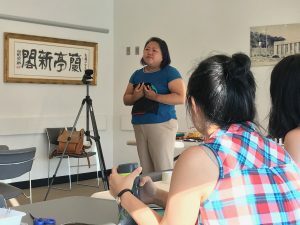 For our second session with Judy Chang, we were concerned that attendance might be low due to especially stormy weather. Although some people ar rived late, we ended up with one of our largest groups — 13 participants! Judy showed more examples of the mola style, and helped our quilters on an individual basis. The more advanced quilters seemed to particularly enjoy learning this less-familiar technique and created some highly personalized designs. 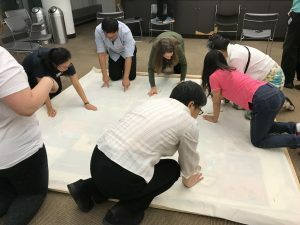 For our second “open mic” session, we invited participants to share their families’ migration stories and how they related to the quilt blocks they had made. Attendees responded enthusiastically, sharing some very personal stories. We ran overtime in this session! 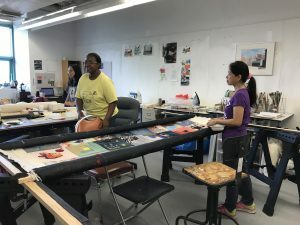 Before this session took place, Naomi spent a good deal of time at her Queens College studio selecting and assembling the 64 blocks that would make up the finished quilt. She basted them together on a large fabric backing and constructed a wooden frame to use in the workshop. Our instructor, Helen Griffin, helped show participants how to sew on the blocks to make it a true quilt. The frame needed to be disassembled for storage at the end of our session, and our quilters enthusiastically pitched in to help! For our second session of quilting around the frame, we were delighted to have a young family join us — the children were enthusiastic to help and disappointed when they had to leave! As both Natalie and Lori were out of town this week, Dacia Metes of Queens Library’s Digital Archives stepped in to assist with the workshop. 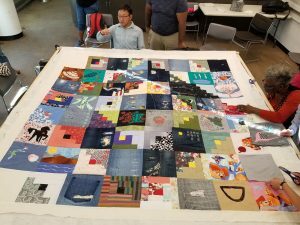 Our participants continued to make progress on turning the assembled blocks into a finished quilt, though much remained to be done before the LilyPads could be sewn into the piece. Our final workshop was a busy evening. 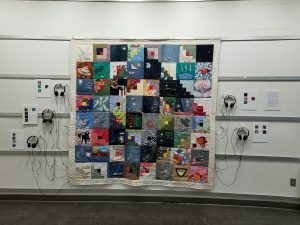 As participants worked to finish as much of the remaining sewing as possible, Lori played the audio clips that would be wired into the quilt. In the last half hour, we spread out the fabric backing onto which the electronic components would be sewn, and marked off where the audio buttons were located. Unfortunately, we ran out of time to attach the LilyPads themselves during the workshop! After the conclusion of the workshops, much work remained to be done to ready the quilt for the August 27 installation. All of the electronic components needed to be carefully sewn in place to line up with the buttons on the quilt blocks. 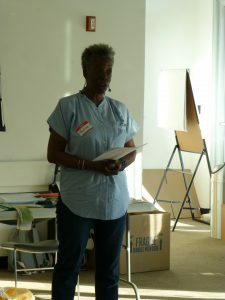 Naomi took everything back to her studio at Queens College and recruited as many volunteers as possible to help finish the task. 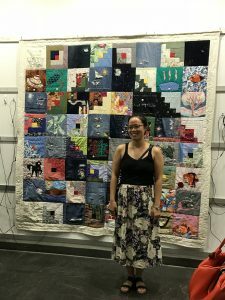 Fortunately, several of our more skilled participants, plus a host of Naomi’s friends and fellow art students, pitched in and the quilt was completed in time! Naomi and Natalie brought the quilt to Flushing Library first thing Monday morning to hang it in the display space outside the lower-level auditorium. 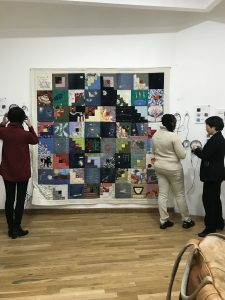 Five pairs of headphones were connected to the quilt to let patrons listen to the clips; signage indicated where the audio buttons were located and identified the speakers in the clips. There was some concern among the library staff that the headphones might be stolen, so RF barcodes were attached. As of 12 noon, the exhibit was open to the public! At 7 pm on Tuesday, we had the official opening of the exhibit. Library manager Yang Zeng welcomed the crowd, and Naomi and Natalie briefly explained the concept of the Story Quilt and how happy we were to witness the communal effort and enthusiasm of all the participants who joined along the way. 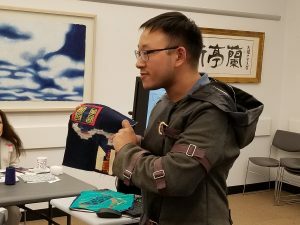 Approximately 60 people attended the opening, including faculty and students from the Queens College Art Department, many of the workshop participants, and curious library patrons. People were eager to listen to the clips and examine the handiwork of the quilters. In a side room, we held a potluck reception for all those involved in the program. Many participants contributed foods from their family or ethnic traditions, extending the program’s theme of “migration stories” even further! 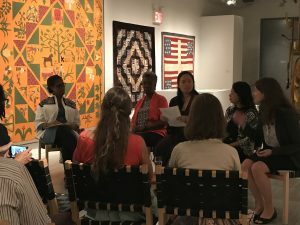 We were honored to be invited to display the Story Quilt and hold a panel discussion about it at the American Folk Art Museum’s Self-Taught Genius Gallery in Long Island City. 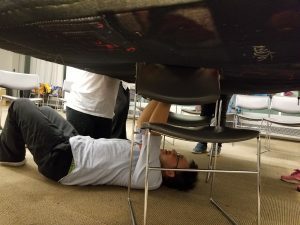 During the final weeks of workshops, we began assembling our panel, generating questions for the discussion, and promoting the event via social media. A few days before the exhibit, Natalie, Naomi, our panel moderator and one of the panelists visited the space. This helped immensely to get a sense of how the quilt could be arranged for attendees to see it up close and listen to the audio clips. We also put together a slideshow of images from throughout the summer to display during the event. 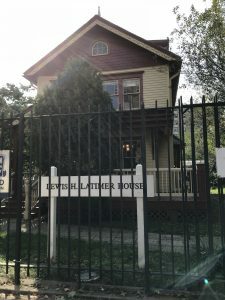 Natalie, Lori and Naomi visited the Lewis H. Latimer House Museum in Flushing to meet with executive director Ran Yan and a member of the educational staff to discuss possible programming involving the Story Quilt. This colla boration was suggested by Jacqueline Colson, a participant in the quilting project who also volunteers at the museum; she attended the meeting as well. The museum hosts many STEM-themed programs for local schools, so a tie-in with the quilt’s LilyPad component seems promising. We discussed demonstrating the quilt in the museum’s Tinker Lab, or developing a new quilt workshop series aimed at the sight-impaired, possibly in the spring pending grant funding. We agreed to keep in touch about these opportunities. 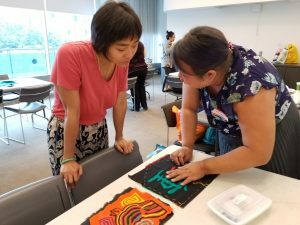 Today Naomi received word that our Story Quilt was accepted for inclusion in the Queens Museum’s Community Partnership Exhibition Program for 2019. 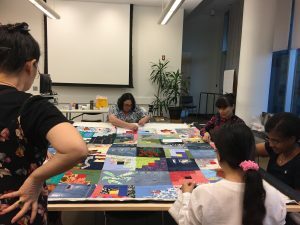 The museum’s representative particularly praised the project’s “strong ties to Queens-based communities while highlighting specific artistic practices as tools for … community engagement work.” The quilt is scheduled for exhibition in July 2019. Natalie and Naomi met with Yang Zeng, director of the Flushing Library, about plans to have the Story Quilt installed as a permanent exhibit at the library. This represents a full circle for the quilt, as it will be displayed in the third-floor conference room where it was created in our workshops! The timing of the installation has not yet been decided, as we plan to show the quilt in several more venues in the coming months, and the library intends to repaint the room soon as well. When the quilt is installed, we will make printed transcripts of the audio clips — in English and Chinese — available for patrons. We also agreed to explore options for making the playback technology more robust for ongoing use. 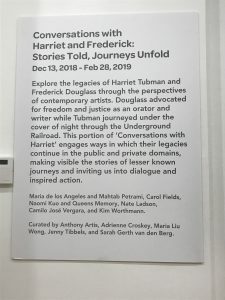 Naomi received yet another invitation to display our Story Quilt, this time at the Walls-Ortiz Gallery and Center in Harlem for an upcoming exhibition on the legacy of Harriet Tubman and Frederick Douglass. 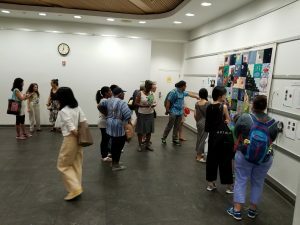 A gallery representative said the quilt represents a “contemporary expression of the work of Harriet and Frederick with regards to their legacies of caring and advocating for the thriving and valuing of all people in community.” We accepted the invitation to exhibit the quilt from Dec. 13, 2018, through Feb. 28, 2019, with installation on Dec. 10. We plan to make the written transcriptions of the clips available here as well, possibly with translations into Spanish. This evening marked the opening of the gallery’s exhibit, “Conversations with Harriet and Frederick: Stories Told, Journeys Unfold,” in which our quilt is included. A standing-room-only reception featured an artists’ panel discussion, with Naomi representing our project. We were happy to see so many visitors engaging with the quilt and listening to the audio clips; gallery staff members have graciously agreed to monitor and recharge the batteries while the quilt is displayed. Among the guests were one of our quilting instructors and three other workshop participants.